Amazon has outed an all-new Kindle Paperwhite, hours after a listing for the updated e-reader appeared before it was yanked. Now, it looks like Amazon is putting its foot down on the new and improved Paperwhite. The e-commerce giant left the Paperwhite's order page - listed as $119 (with special offers) - up for all to gawk at. Without special offers (a.k.a. ads), the new Paperwhite will retail for $139, though it looks to be U.S.-only for now. The Paperwhite's price converts to about £76/AU$131 and £89/AU$153, respectively. We're not looking at a completely made-over machine here, instead seeing some incremental improvements that should be welcome to readers. New display tech supposedly boosts the screen's contrast renders and offers better reflectivity, while a next-gen built-in light helps guide light closer to the screen, translating into less eyestrain. The processor is 25% faster, so you should be able to breezily flip through pages and look up tip-of-the-tongue definitions. A 19% tighter touch grid supposedly helps the new Paperwhite respond to even the smallest pricks with increased accuracy. While the outside looks largely the same and there's not a drastic jump in internals, there are a few software additions that should make the device a better buy than before. The new Paperwhite (we're back to trying not to write "Paperweight") will eventually land with Goodreads integration, offering users a peak at what 20 million-plus users are leafing through plus the ability to rate reads. 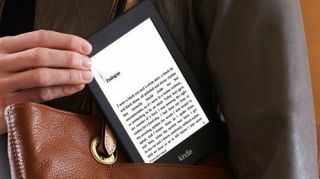 Kindle FreeTime for Paperwhite is also on the way, geared towards giving younger readers some age-appropriate incentives to hitting the books. The new Paperwhite will also feature Smart Lookup, Vocabulary Builder and Kindle Page Flip features. Update: AllThingsD reported that the new Paperwhite doesn't say "Kindle" on the rear casing, but instead has "Amazon" inscribed on its backside. Peter Larsen, Amazon vice president of Kindle product management, told the site the change was due to international recognition ambitions. "Amazon" is apparently more recognized than "Kindle" outside of the U.S., so as the company moves into countries like India, China and Mexico, it wants "Amazon" front (or back) and center. Got any plans for Sept. 10?